The new infant, however, did not appear quite so soon as was expected, and the last letter of the series is written by George Austen on December 17, 1775. DEAR SISTER,–You have doubtless been for some time in expectation of hearing from Hampshire, and perhaps wondered a little we were in our old age grown such bad reckoners, but so it was, for Cassy certainly expected to have been brought to bed a month ago; however, last night the time came, and without a great deal of warning, everything was soon happily over. We have now another girl, a present plaything for her sister Cassy, and a future companion. She is to be Jenny, and seems to me as if she would be as like Harry as Cassy is to Neddy. Your sister, thank God, is pure well after it. George Austen’s prediction was fully justified. Never were sisters more to each other than Cassandra and Jane; while in a particularly affectionate family there seems to have been a special link between Cassandra and Edward on the one hand, and between Jane and Henry on the other. Jane’s godparents were Mrs. Musgrave (a connexion of her mother’s), Mrs. Francis Austen (another Jane), wife of George’s kind uncle, and Samuel Cooke, Rector of Little Bookham. Happy birthday, Jane! May birthday cake and French wine flow long today out in the ether. Gentle Readers, your party hat is hereby provided; Dorothy is serving vanilla rooibos and cake in the conservatory. Please feel free to leave your birthday greetings in this thread! ETA: As on Jane’s birthday every year, JASNA has published the Winter 2009 issue of Persuasions On-line for your reading pleasure. Tags Happy Birthday Jane Austen! P.S. I tried to post this at midnight like a good Janeite but my Internet was down! Gah! Thank You for Being You, and for your legacy: a present from you to us. ¡Feliz Cumple, Jane! We value your work more each year! Happy Birthday Miss Austen! You continue to be a great gift to so many of us. Happy Birthday Jane Austen! Knowing it was your 239th birthday helped me get through my applied statistics final this morning! It *is* a blessed day. A very very happy day!! 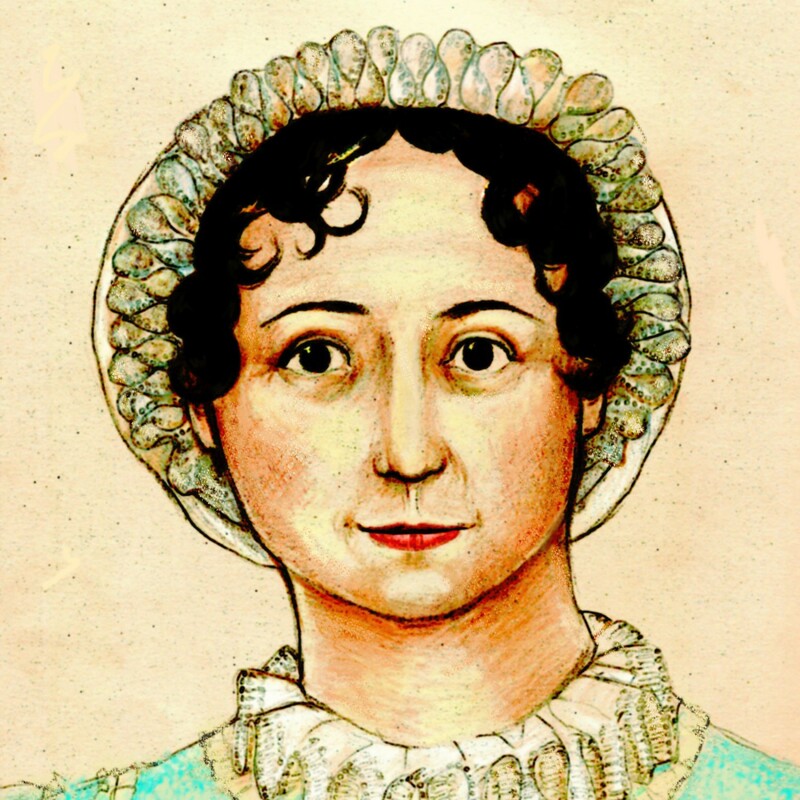 It’s her *234th* birthday (1775-2009), folks, not her 239th! I guess it’s pretty obvious we’re all English majors here. . .
It’s lovely touch to talk about JA’s love for her family and vice versa here on her birthday. Her books focus on this topic too. Happy Birthday Miss Austen, and thank you for your books that we have enjoyed through out the years. We will always treasure them beyond all things. I just noticed the silhouette on the party hat. Very clever, Mags! Belated Birthday Greetings to our dear Miss Jane… party like an animal !! Happy Birthday to the incomparable Miss Austen who has provided me with great joy through her lasting works.